Alex Flores Guest Blog: Obama/Biden 08! This is a guest post by Alex Flores, who blogs at Alex on Politics. Alex is from Corrales, NM and will be working on a Master's at Princeton. He'll be serving as a Page at the Democratic Convention, assigned to Democratic Party of New Mexico Chairman Brian Colón. Campaign back channels are confirming Senator Joe Biden will become Senator Barack Obama’s Vice-Presidential Nominee tomorrow. It’s going to be an impressive duo to watch this election season! 10 weeks to go. 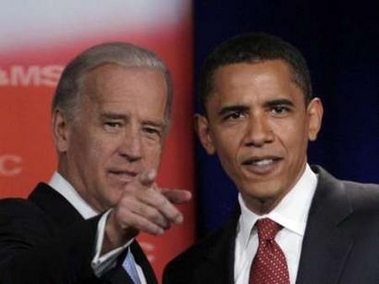 Tonight, confirmation that the United States Secret Service has dispatched a protective detail to assume the immediate protection of Sen. Joseph Biden, D-Del., a source tells ABC News, indicating in all likelihood that Biden has been officially notified that Sen. Barack Obama, D-Illinois, has selected him to be his running mate. Biden is a long time Senator who will absolutely challenge Senator Obama’s policies and hopefully pull the administration in a more progressive direction. From what we known, Jill Biden is impressive herself and will add to the already strong supporting cast in Michelle Obama and all of the campaign’s surrogates. Biden is a senior statesman who will bring foreign policy experience to the table, a working class background, and even has a son who will be deployed to Iraq on October 3 (Joe “Beau” Biden is also Deleware’s Attorney General and a Captain in the State National Guard). Compare this to Joe Biden who in 2005 was ranked 99th out of 100 senators in terms of personal wealth. And amazingly in 2006, Open Secrets lists Biden as 108th out of all US Senators (i.e., negative 8! How did he do that?) with a near negative value on total income and assets. Biden has not enriched himself through marriage, book deals, land swaps, or even betting on Intrade. That’s an interesting contrast to Senator McCain…. I’m excited to see them together tomorrow in Springfield, Illinois and later this week in Denver at the Democratic National Convention. 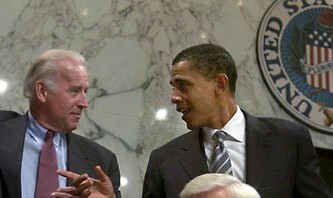 Afterwards - look forward to Biden dismantling his opponent in the Vice-Presidential Debates! This is a guest blog by Alex Flores of Corrales. Guest blogs provide our readers with an opportunity to express their opinions on pertinent political issues. If you'd like to submit a piece for consideration as a guest blog, contact me by clicking on the Email Me link on the upper left-hand corner of the page. The DNCC has announced the speakers for the third night of the Dem Convention, and Gov. Bill Richardson is among them. I would think that pretty much rules out Richardson being picked by Obama for VP because the VP nominee is set to be the keynote speaker that same night. Of course it also appears to rule out Evan Bayh and Joe Biden, who will also be addressing the delegates on Wednesday evening. Will Obama's VP be a Republican? Notice how Obama's foreign policy is characterized as essentially nonpartisan in the release. A clue that Sen. Chuck Hegel -- or even Colin Powell -- will be Obama's pick? Pure conjecture at this point. From the DNCC and Obama for America Campaign: Wednesday’s program – Securing America’s Future – will feature the voices of Americans who share Barack Obama’s vision of making America stronger and safer. The headline prime-time speaker on Wednesday will be Barack Obama’s Vice Presidential Nominee. Barack Obama offers a new, tough foreign policy approach that is neither Republican nor Democratic. Obama will implement a strong, smart American foreign policy that makes us more secure at home and advances our interests in the world by ending the war in Iraq responsibly and focusing on the threats of the 21st century - al Qaeda, nuclear weapons, and energy security. Former President Bill Clinton will speak on Barack Obama’s commitment to a stronger and safer America, as well as the history of Democrats making positive change in the lives of all Americans. Governor Bill Richardson and Senators Evan Bayh, Joe Biden and Jay Rockefeller will echo Obama’s call for a new direction in national security and outline his policies and plans to secure America’s future. One of the greatest security challenges facing the country today is reducing our dependence on oil, especially from foreign sources. Senate Majority Leader Harry Reid will discuss Barack Obama’s plans to make America more secure by investing in smart energy policies. Senator Ken Salazar, the Convention’s home state Senator, and House Majority Whip James E. Clyburn will also speak as part of the Securing America’s Future program. A bedrock component of Obama’s national security plan is increasing our support to active duty military, veterans and military families. Representative Patrick Murphy (D-PA) and Iraq War veteran Tammy Duckworth will lead a tribute honoring those who give so much to secure our nation’s future. Click to see the complete listing of New Mexico delegates to the 2008 Dem Convention. Check this archive for previous posts with videos of our delegation and this one for other Convention-related posts. The Democracy for New Mexico blog was selected by the DNC to serve on its State Blogger Corps representing New Mexico. We have floor credentials and will be seated with the NM Delegation for the four days of the Convention so we can blog about the local angle from Denver. DFNM will have videos, photos and stories about the event starting the weekend of August 23rd. Videos by M.E. Broderick, from a recent gathering of NM delegates. A week ago Sunday we posted our straw poll to discover your favorite Dem VP candidate, and the results are in. Check below the fold for complete results. Your top choices were Gov. Bill Richardson (21%) and John Edwards (15%), with Hillary Clinton and Gen. Wesley Clark tied for third with 11% each. VA Senator Jim Webb finished a close fourth with 10%. Trailing the field and getting zero votes were former Senator Sam Nunn, GOP Senator Chuck Hagel and VA Gov. Tim Kaine. According to an article in the Virginia Pilot, Sen. Webb is getting significant online buzz, second only to Hillary. "A Google news search last week for "Jim Webb and running mate," produced 1,717 hits. A "Jim Webb and vice president" query brought 2,413 responses. Webb's totals eclipsed those of every other Democratic prospect, save Clinton, a special case thanks to her quest for the top spot and status as a former first lady." Meanwhile, talk seems to have dissipated about a VP slot for Richardson, and his recent international travels indicate he might be more interested in become Secretary of State in an Obama administration. In recent weeks Richardson has been negotiating deals and meeting leaders in places like Mexico, Israel, Germany and Spain. Pressures on Obama to pick Hillary to fill out a "unity ticket" also appear to be waning given the problems inherent in having Bill Clinton looking over Barack's shoulder. Former NATO Supreme Commander Wesley Clark's name is getting mentioned more frequently, and he seems to have genuine interest in becoming VP. He's been out and about in the media showing off his credentials and ability to go after McCain in a tough and credible manner. Lots of leaking has also been going on of other possible VPs with military experience, including former Air Force Chief of Staff, Gen. Tony McPeak; Maj. Gen. Scott Gration, who has advised Obama on military matters; Richard Danzig, Secretary of the Navy under Clinton; former Chairman of the Joint Chiefs of Staff Hugh Shelton; former NATO Supreme Allied Commander Gen. James Jones; and retired Marine Gen. Anthony Zinni, who's a former CENTCOM Commander and was an early opponent of the Iraq invasion. Former VA Gov. Mark Warner recently he's not interested in the VP slot, and that he fully intends to continue his run for U.S. Senate instead. John Edwards doesn't seem very excited about running as VP again and has essentially said he doesn't want the role, although he later said he'd take it if Obama insisted. Ohio Gov. Ted Strickland has withdrawn his name from consideration. Now that Obama has clinched the Dem presidential nomination, talk has turned to possible VP choices. Click onto the continuation page below the fold to vote for your favorite VP candidate. You have from now through next Sunday to vote, one vote per person. To help you out, check out Mother Jones' info on the pros and cons of most of the potential VP candidates listed in the poll.